I have a ton of fiber (most of it very dirty) that I need to get carded so I can spin it. I do have wool and cotton carders, but the problem is that I now have some shoulder and elbow issues, so the carders are a little bit hard. I've looked at drum carders, but they are very expensive and it seems like you still have to really prep your fiber (plus you have to crank it), so it may not work for me. I like processing the fiber myself; I don't want to send it out. From what I've seen of combing from videos, it appears to be a little easier on the elbows than carding. If I can clamp one comb to the table and then use two combs (one in each hand), I should be able to get it done fairly quickly. Would you agree that combing is easier physically, or just as challenging as carding? Can you recommend some combs, please? I have wool and alpaca (very dirty) and also lots of cotton that I grew myself, so I will be processing both short and long fibers. All fiber prep will be wearing on the hands, wrists, and shoulders. If you are finding carding tiring, you will find combing to be equally so; there is no prep technique that will not have your arms screaming to be put down after half an hour. 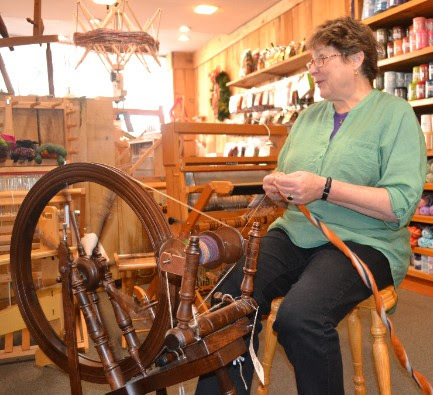 There is also no such thing as getting it done quickly; even with a drum carder (and there we have expense and still needing to hand-crank the thing), the best rate that you will get is about a pound an hour. Hand carding or hand combing will yield you about 4 ounces an hour, at best if you are lucky. The best strategy is a mental one; one is prepping for the enjoyment, it is all part of the game, and all things in moderation. For alpaca, fine double-rowed wool combs are the best; they will also help get the debris out. For wool, you don’t mention the grade or length, so it’s a little tough to advise on that; but probably fine single row. For the cotton, cotton hand cards are best; the fiber is really too short and challenging to hand-comb at home. Hope this helps! Hello, I have been spinning for a few years now but have always had my fiber processed by a mill. This year I have a fleece from an older alpaca I want to play with carding myself. What size or rated hand carders would I need for Alpaca? For most alpaca, cards in the 90-110 range will do just fine. In size of cards, the full-size are always going to be the most efficient. If you have any wrist or hand issues, then scale down to the student-size or even the minis, to give your wrists a break; though efficiency will suffer. Don't forget to check out our YouTube channel for more answers to your fiber and weaving questions! In the above video, we talk about the differences between combing and carding; click here to see more videos in the Ask the Woolery series.